Zetafax is reliable and robust fax server software that will adapt and expand as your business and communications needs grow. Save time by faxing directly from desktop software and e-mail. With Zetafax, faxes arrive immediately on screen or paper. 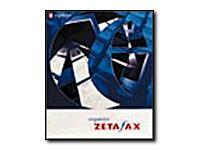 Zetafax 7 allows the Zetafax client to run in an application server environment. Support for Windows 2000, support for ISDN controllers and e-mail gateway support for Lotus Domino are just a few of the other enhancements. A Zetafax toolbar is now included as standard in MS Outlook. From the toolbar you can select "new fax", "rush fax", "hold fax", "release held fax" and "abort fax". Addresssing e-mails to fax recipients is now as simple as selecting the "New fax" button. Once you have entered the fax recipient details Zetafax will automatically store them in the Zetafax address book. Zetafax 7 supports SMTP mail systems such as Send Mail and Eudora. An e-mail gateway for SMTP mail systems allows network users to send and receive faxes just like e-mail. Add-Ins for Microsoft Word, Excel and Powerpoint will increase productivity significantly. When sending faxes from these applications users can now select the automatically installed Zetafax button and the Zetafax addressing dialogue box will appear immediately.